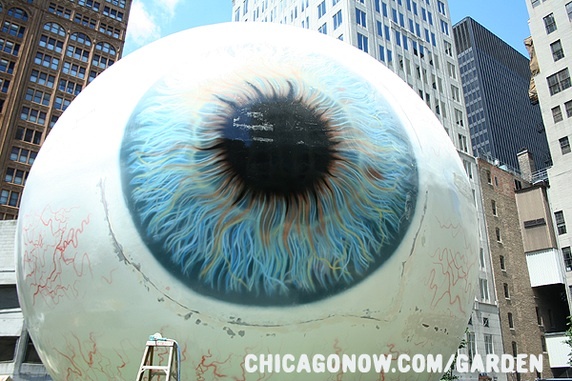 Open your eyes, Chicago, and meet the gaze of a 30-foot eyeball. That stare–from the 30-foot “EYE” sculpture–officially opens this morning in Chicago’s Loop. Tony Tasset, the artist behind the eyeball–adorned with a blue iris and blood vessels–modeled it after one of his own. For help with his handiwork, Tasset turned to Wisconsin-based Fiberglass Animals, Shapes & Trademarks. Sculptors built and painted the ocular mass by hand, using between 8,000 and 9,000 pounds of fiberglass and another 9,000 pounds of steel. The installation is funded by the Chicago Loop Alliance, a group of businesses that brings events and pop-up artwork to the area. Along with “EYE,” the CLA is also sponsoring Tasset’s “CARDINAL,” a collection of 156 red-cardinal adorned street banners. The project cost “a little over the six-figures mark,” said CLA Executive Director Ty Tabing in the Chicago Tribune. “EYE” will hold its unrelenting stare until October.